For those inquiring about trips to Wild Love, as soon as we are able to get Wild Love's 136 wild horses moved to our permanent home, we will be able to start booking your visits. We look forward to sharing the wondrous wild side with you! October 19, 2017: Outdoor Idaho premieres "Wild Horses" on Thursday, October 19 at 8 p.m. and again on Sunday, October 22, at 7 p.m. on Idaho Public Television, which features Wild Love Preserve. The cover of Outdoor Idaho's October 2017 Program Guide which features a photograph of the White Mask Stallion by Andrea Maki. August 21, 2017: The Total Eclipse at Wild Love Preserve: WLP Blog Post with Video. Story published in Bored Panda: How Did Idaho Wild Horses React To The Total Eclipse? August 18, 2017: Solar Eclipse To Pass Right Over Special Idaho Wild Horse Herd in Horsetalk Magazine. April 19, 2017: “Not Many People Know About This Wild Horse Sanctuary Right Here In Idaho,” published in Only In Your State: Idaho and Idaho Only. March 19, 2017: "Idaho's Wild Horses Spared Helicopter Gather Trauma," published in New Zealand's international Horsetalk Magazine. September 2016: The Story Behind Wild Love Preserve Featured in Idaho Magazine - Story and Photos By WLP Founder Andrea Maki. Click here to read special blog post with this WLP Story. August 16, 2016: Wild Love Preserve is honored to receive a 2016 Top Rated GreatNonprofits Award, following 2013 and 2014 awards. We invite you to visit GreatNonprofits to read WLP reviews. March 2016: Wild Love Preserve is featured the German Equine Magazine, CAVALLO. Click for this WLP Blog Post. February 21, 2016: Horsetalk Magazine: "Song of the Wild Horse: New Single "Mustangs" Celebrates Idaho Equines"
December 22, 2015: "Watch this 2009 Wild Challis Horse Return to Wild Side, Friends and Family"
We had a special delivery from Santa this year! What better way to ring in the New Year! In light of ending one cycle, and beginning another we wish to share this wonderful and breathtaking good energy which truly reflects the heart and mission of Wild Love Preserve. It is pure love and truth in being. Read Adee’s Story and watch the video at The Dodo or on our WLP Blog. 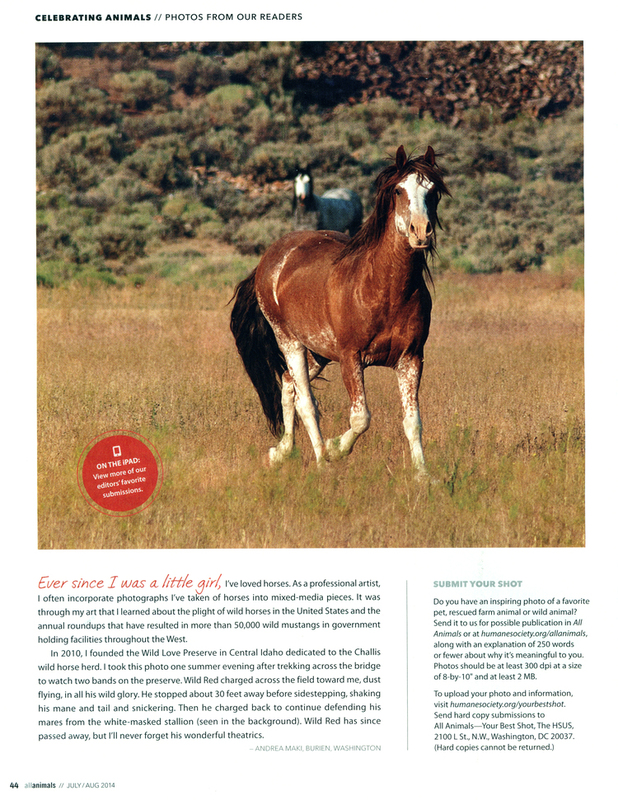 Published in The Dodo, November 29: “A Special Love Story: How We Saved 130 Challis, Idaho Wild Horses From The 2012 Challis Roundup” and on our website blog: "Saved At Home"
July 9, 2015:Wild Love Preserve featured in Horsetalk International Magazine out of New Zealand. 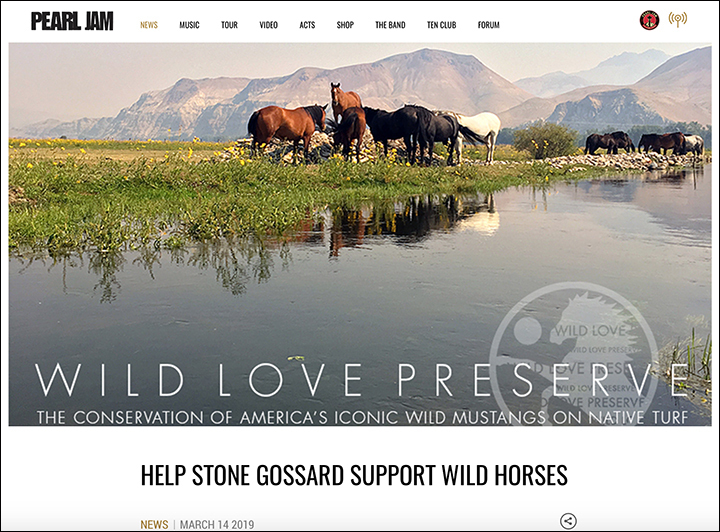 "Call of The Wild Horses in Idaho: Preserving an American Icon"